God wants all believers to know His will in their daily lives. Pray especially for young people who are seeking God's plan for their lives. May they be "strong in the Lord and in the power of His might" (Ephesians 6:10). As they seek to serve the Lord in different vocations, pray that they will "put on the whole armor of God" and that they "may be able to stand against the wiles of the devil" (Ephesians 6:11). Slavic Missionary Service clearly remembers when former President Gorbachov declared freedom for the Soviet Union. National missionaries began to form Bible study groups. SMS organized support for these national workers. Training and guidance followed. These national missionaries joined SMS and began to win souls for Christ. Then, the daunting task of securing property and construction began. During this tremendous time, a lot of loving participation by a lot of people quickly appeared. The results are visible by new church buildings! Thank you for being part of this “Body of Christ” activity! Twenty-five years ago, these churches did not exist. Jesus said, “I will build My church; and the gates of hell shall not prevail against it” (Matthew 16:18). SMS continues the blessed task of soul winning and church planting. The doors are still open! 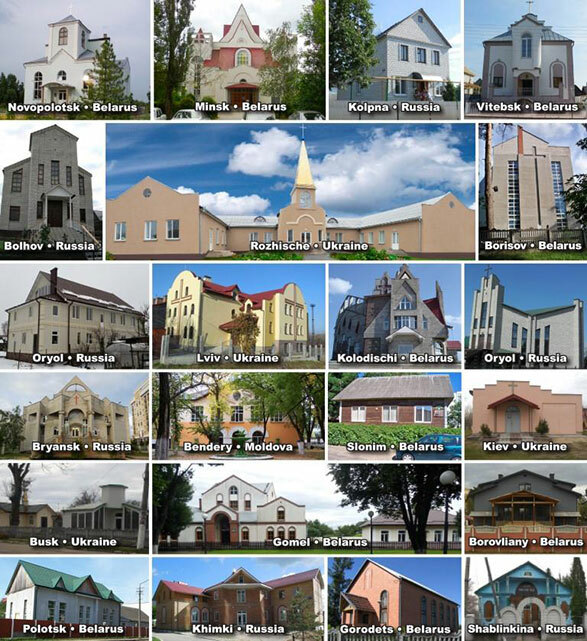 There are areas in Slavic towns and cities where there is yet no church building or property. There are some cities where there are thousands and thousands of people and just a few churches to reach them. Costs have increased, and new restrictions have caused a decrease in interest. But new churches can be built! “For with God all things are possible” (Mark 10:27), especially when it comes to building the church. Slavic Missionary Service invites you to assist by praying and by supporting this inspiring and impressive work, while there is still time! Consider what you can do to continue construction in the Slavic countries. This is how God showed his love among us: He sent his one and only Son into the world that we might live through him..
With a heart of compassion, pray for the salvation of souls on each of the continents of the world. Pray that the Gospel of Jesus Christ will spread to the seven billion people throughout the world. "The Lord… is not willing that any should perish, but that all should come to repentance" (2 Peter 3:9). Ask God to strengthen you to be a witness for Him wherever you are and in whatever you do!